This page lists the release date and version of each product. It has the changes made in that version. If you have specific questions or would like more details on a new function, please contact us and we’ll get back to you as soon as we can. Note: Minor version releases may not be listed. How to determine my version? Decreased file open time and added more status bar messages throughout showing progress during longer macros. Removed a reference to prevent a “Compile Error” when working with different versions of Excel. Updated the method of sending company and contacts status updates to prevent the same status being sent multiple times. Reset search to default to “values” instead of “formulas”. Added an option to display new Outlook messages when they are being created in batch mode. When using the zip code radius filter, it asks if blank zip codes should be left in the list. Added a warning message when using Excel’s built in Save as function with suggestions on how to properly “save-as” a different bid list. Numerous other bug fixes and performance improvements. Fixed issues that came up with duplicating or moving contacts within the bid list. Improved the move column functionality. The customized order will also be saved when the bid list is upgraded. Improved the custom column function on the contact sheet. Custom column data will be copied over during an upgrade. Improved error checking of email addresses in the contact edit form. Fixed a bug that would cause an “overflow” error on the contacts sheet. Contacts that are filtered out but have a status update will be shown after an update. When importing a previous bid list all contacts with a bid status on the old bid list will get a “Y” in the invite status column in the new bid list. Added a report button to the toolbar and created a new coverage report. The electronic ITB (eITB) web page allows subs to update missing company address information and decide if they want a confirmation email sent to themselves. Fixed a bug that would cause an #N/A error after an update. Fixed a bug when quickly changing invite or bid status. Fixed a bug that might leave the company tab unprotected. Made changes to sync with Scope Sheet contact and correspondence log changes. Removed add-in check when opening the Bid List. Added a button the Bid List setup box to open/sign up for the online directory. Standardized time stamp formatting across Bid List and Scope Sheet. Bug Fix: Issue where the signature wasn’t being added to Outlook 2016 emails. Bug Fix: When using Personalized Mass Email, the spell checker would try to correct map links. Numerous formatting and performance improvements. Fixed a bug if the CSI description had a space at the end. Can re-assign a contact to an existing company. Fixed a bug with the Last Update stamp. Updated the CSI trade selection & Company drop down box in the contact form to be a text box that filters as your type. “Bid taker” assignments on the CSI tab are synced across bid lists. Added a column on the CSI Trade sheet that allows the estimator to insert custom trade numbers and/or descriptions that are specific for that project. Useful if the estimator wants to use the same trade division codes as the project specifications. CSI code numbers can be any length and have decimal points. A third option was added to the ITB response screen subcontractors see. 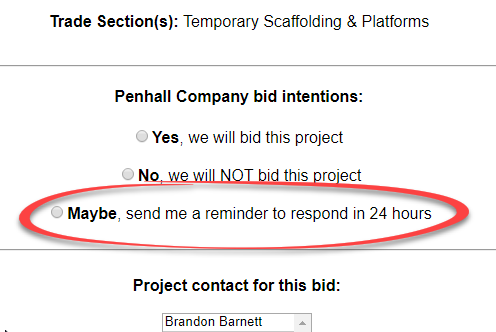 “Maybe” was added in addition to “Yes” and “No” which will send the subcontractor a reminder in 24 hours to submit their bid intentions after they have had time to review the contract documents. Added a text field in the Project details for an internal company job or project number. Improved how trade divisions are listed in customized mass emails. When you you double click “CSI Description” it offers the option to also include the CSI number. Improved filtering and freezing panes on each sheet. Fixed a bug where user might see an #N/A error on the contact page if the CSI tab was filtered. Fixed a bug when trying to create a new CSI trade the last edited CSI data would be in the form. A number of other performance improvements. Added an option to work in Parent or open Child bid list after creating a Child bid list. When creating a Child bid list the default save to folder is the same as the Parent bid list. 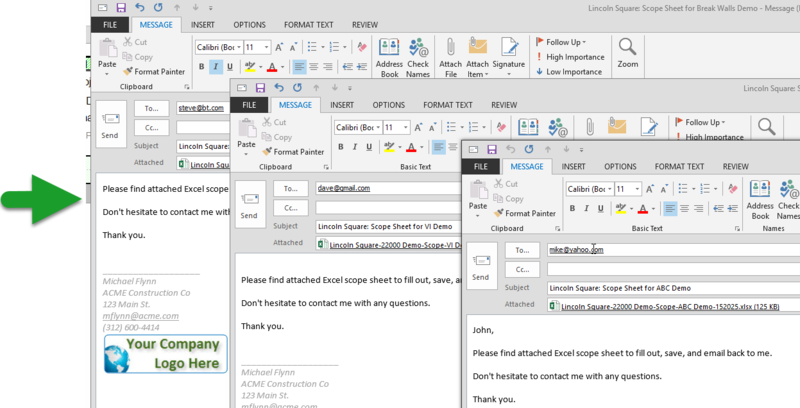 Insert a hyperlink in customized mass email (so it looks like text.) Use Insert Hyperlink under Format menu. Fixed a bug when saving a custom email template the bid due date wouldn’t always work. Improved reply-to handling in custom mass email function (if there is a bid taker it will send responses to both the assigned bid taker and email addresses in the reply-to option field). Added syncing of included companies when a bid taker is assigned between Parent and Child bid lists. Bid takers are added to the company tab and each bid taker can add or remove included companies for the companies they are assigned to. Fixed a bug where a synced comment would have the same comment multiple times. Vastly improved the change data stored in comments. When recording a call or email it will track that for all instances of that contact if the other CSI trades are included for that project. When adding a business main phone number it will cycle through all contacts at that company and put the number in those that have a blank business phone number. Project specific note column headers are synced across Parent and Child bid lists. Added ability to copy and paste from the Bid List to another Excel document. Exported bid lists and correspondence logs will save to the parent bid list folder by default. Cosmetic fixes for forms when using Excel 2016. Numerous other stability and performance improvements. New: Added project description into personalized mass email form. Bug Fix: Fixed issue where long project descriptions weren’t syncing properly. Bug Fix: If formula on CSI tab was blank it would cause an error when trying to edit a contact. New: Added a message if a lot of updates need to sync to stay patient and look in the status bar for additional details. Bug Fix: If a hyperlink wasn’t formatted properly it would cause an error. Removed code that auto-sized company columns added to the contact sheet. Manually resizing columns will stick. Bug Fix: Fixed an issue that could cause non-14Fathoms Excel sheets to get password protected. New: In the project details form added buttons to test URLs to make sure the point to the correct page. New: Added bid taker column on CSI Codes Sheet. Assign a team member to a specific CSI section. 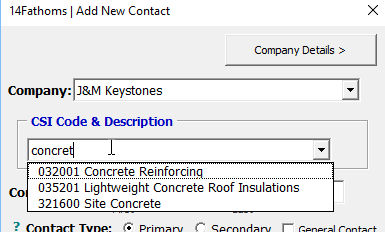 Assignee shows on Contact tab and Personalized Mass Emails can be directed back to assigned estimator (Outlook only). New: Added common trades designation on CSIs. Assign common CSI trades for your company and quickly select them. New: Added company history query data. Use the “History” tab in the Contact form to see current and historical jobs bid. Improved email send functionality (Fixed a copy/paste issue when trying to copy email addresses to your clipboard). Improved default calculation mode (set in About box) to minimize issues when working between workbooks. Bug Fix: Added code to add “Y/N” option dropdown on to all CSI Codes on the CSI sheet. Bug Fix: Company column data on contact sheet matches the format on the company tab. Improved Master Bid List File Location when stored on a network drive. Multiple other performance and stability improvements. Added Refresh/reset button to toolbar. Disappearing CSI Code number bug fixed. 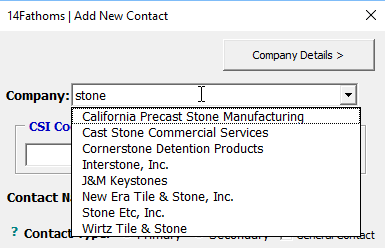 Improved company column data on contact tab when there are changes. Upon contact deletion, check if it leaves any Primary contacts at that company. If not, warns user to make another contact primary. Improved company columns data on contacts tab (was an issue when adding a new contact or using custom sorting). Added 7 more “Company System Info” columns (total of 12). Added 5 “Company Project Note” fields. Added Bid Packages that can be assigned to companies and used to filter/sort companies. Improved filter on company options. Double click the underlined headings. Added ability to sort on any Company or Contact column. Right click on desired column and select sort. Added ability to customize Bid Status options and formatting (go to Bid List Setup, then “Customize Bid Status…” button). Tweaked adding Company data on Contacts sheet (go to Bid List Setup, then “Show/Hide Company…” button). Add time zone details on Project details. Fixed #N/A bug on contacts tab when adding a new company when the company list is filtered. Improved eITB tracking of emails. Added first row & blank row limits to add/remove package right click function. Prior version change information may be added over time. IMPORTANT: AutoSave has been disabled. THE FILE ONLY SAVES WHEN YOU CLICK THE SAVE BUTTON. Updated the copy/paste functionality to make it more “natural”. Note: Undo functionality won’t work after pasting. Added option to not save the file while sending updates to the Top Sheet. Added code to try to bring success message boxes to the front of the screen. A. Click the File tab, then “Options”. B. In the Options dialog box, click “Advanced”. C. Look in the “Display” area, click to select the “Disable hardware graphics acceleration” check box. D. Click OK to save. Customize the Master Scope Sheet Template heading colors to better brand the scope sheet for your company. You can show/hide the bid statistic rows on all sheets from the Template. Just double click the Show/Hide button from the “Template” sheet. Fixed bug with the Master Template location and warns user if they aren’t using the proper file. If the project has “test” or “1234” in the project name it will only ask you once if you want to hide it from the list of available projects. Added a default folder to store new projects. Set in the Master Template setting section. Added code to check and warn user if they opened the scope sheet file as an attachment directly from Outlook which saves it a hidden, temporary folder. Always download and save the attachment to a project folder before opening. Provide more information in the status bar when activating the Top Sheet and turning Live Updating on/off. When using the “Save As Different Scope Sheet” function allow user to choose a folder location for the new file. Fixed a bug when merging in sheets and there were more rows on the template than merged file. Fixed the page layout so trade sheets will print properly. Fixed a bug when sorting scope items. Added conditional formatting to Top Sheet to hide cell errors (if no low bidder) when Live Updating is on. Added check and warn user if they edit the project name for a new project. If so, instruct them to use the “Save As A Different Scope Sheet” function instead. Other bug fixes and many performance improvements. Fixed an issue that would cause random crashing, especially if multiple 14Fathoms files were open. Fixed a bug where the calculation mode would not revert to “Automatic” on a custom sheet when coming from another 14Fathoms’ file. Export scope of work to Microsoft Word document functionality added. You can also use a company template (with your logo, standard contract language and formatting). Just include the [14FathomsScope] tag where you want the scope inserted. Click Reports in Scope Sheet toolbar. Click Scope of work Word Document option. Select the trade(s). Each will be it’s own word file. Optional: Select an existing Word document to use as a template. Include [14FathomsScope] where you want the scope inserted. Click the Generate button. Created word documents are saved in the same location as your Scope Sheet file. Increased size of trade sheet select box and can filter on trades while inserting multiple sheets. Control + Alt + Up Arrow: Moves selected scope row up. Control + Alt + Down Arrow: Moves selected scope row down. Control + Alt + Right Arrow: Indents text of selected cell. Control + Alt + Left Arrow: Outdents text of selected cell. Improved right click navigation: can now jump quickly to custom sheets and the TopSheet. Added additional “Advanced settings” in the About box to allow the user to tweak their application and make it more responsive. Settings are saved to your computer so you only need set once for all files. Added additional “Advanced Setting” to About box to tweak application. Fixed a bug where not all trade sheets were visible when extracting for a coworker. Fixed a bug when reordering trade sheets. Added more status bar updates to identify bottlenecks. Turned off printer communications by default. IMPORTANT: Anti-virus software can cause the Scope Sheet to freeze or shutdown. Talk to your IT department about excluding/white-listing all .xlsm files or files in your project folders. A help file showing how to do this is in process. Fixed a bug when opening another file that is in [Protected View]. Fixed a bug when double clicking a trade on the Top Sheet to jump to that sheet user may get “this data is linked to the template” warning. Fixed a bug when exporting/importing a scope sheet if any of the rows have an error (#n/a, #ref) in them. Fixed a bug when attempting to add rows in prohibited places. Added “Offline” mode when a slow network connection is present. Can manually enter that mode in the “About” box. On bidder report, identified subs with “Ignored” bidder type with an *. 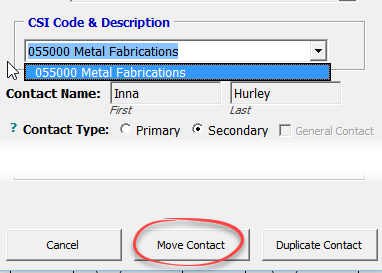 Your “Insert boilerplate scope” selection on the add trade sheet form is saved so you don’t have to uncheck each time. Top Sheet: if the low bidder differs it flags that row even if the row is collapsed an not using Live Updating. Added more status updates when upgrading file. Fixed a bug where a file couldn’t be archived unless it had a trade sheet. Added a warning message when user attempts to use Excel’s built-in “Save As” function. Turned off a setting in Excel 2013+ which will cause the screen to flicker but should minimize macros locking up. When adding a trade sheet it will remember if you want to add boilerplate scope by default. Improved the format functionality to make it quicker. 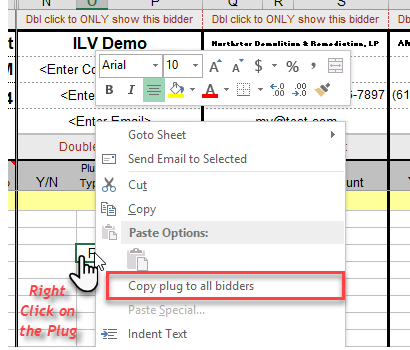 Added ability to copy plug types and amounts across all bidders using right click menu “Copy plug to all bidders” option. Store the link to a sub’s bid proposal directly in the file. Double click to open it and view the proposal. Changed the comment heading to say “Hide” instead of “Delete” column to avoid confusion. Remove the shrink to fit text on the Top Sheet for the trade and company names. Added option to auto size all rows on all trade sheets. The insert and delete keyboard keys will be reset when using the Refresh Macros button. (Helpful when copying from one 14Fathoms to another). On an upgrade the Plug options (typically cell C6) are copied over so they can be customized by your office. Extended the spell check tool to check sub column notes/exclusions. Fixed a bug where right click menus wouldn’t show while in page break preview mode. Removed Send to top sheet double click button. Now use the Top Sheet menu button in the ribbon menu. Added ability to ignore warning box when copying and pasting to and from 14Fathoms files. New bidder column background colors will match what is in the scope description column. Fixed a bug during upgrade where the sheets wouldn’t be in the right order. Fixed a bug when clicking “Duplicate Scope Sheet” button. Fixed a bug when trying to extract a trade sheet whose tab was just a number. Added option to include subcontractor comments on the exported file that is sent to subs. Split up the autosize scope rows and hide blank rows into 2 buttons and added separately in right click menu. Fixed an issue where forms wouldn’t display on a multi-monitor setup. Columns are added next to the bidders. Add/modify your bidder notes in these columns. Fixed a bug if you hit the insert or delete hotkey on the Setup tab. Added Send data from this Trade Sheet and Send Data from ALL Trade Sheets to the Top Sheet button in the Scope Sheet toolbar. Clicking these buttons is the same as double clicking the “Send to Top Sheet Summary” button on the bottom of the top sheet button with drop down to send all sheets. Save as a different project scope sheet function added. Access from the Scope Sheet Functions drop down menu. This will create a new project Scope Sheet file from an existing scope sheet. This is useful if you need to use the same scope sheet for another iteration of the same project bid or to bid a new project that was similar to a past project. Click the button and add the new project and file name. Select the data you want carried over from the old project scope sheet file to the new file and click the Create button. In the example above, the due dates will NOT be carried over to the new file. The bidder names and contacts will be carried over, but the sub’s responses, amounts bid, and other bid specific data will not be copied. Added the ability to show or hide trade sheets and custom sheets. 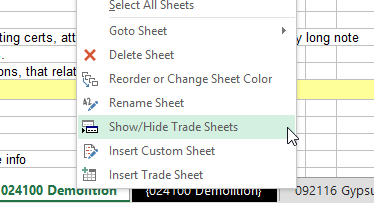 Right click on a sheet tab or click the “Show/Hide Trade Sheets” button in the Edit Trade Sheet drop down. When formatting the scope sheet as one page, the instructions and Y/N column headers will repeat on each sheet. Checking for Top Sheet updates will check the database even if there aren’t any externally linked sheets. This allows for a user in a separate trade sheet to add a new trade, save their changes and when the Top Sheet updates it will ask if the new trade and data should be added to the Top Sheet. Added a link to the 14Fathoms online directory to the About screen. Fixed a bug when exporting a scope sheet and the stored network drive location doesn’t exist. Fixed a bug when exporting a trade sheet for a subcontractor and there was text to the right of the last bidder. Fixed bug in Excel 2013 when trying to sort bidders by amount or name. 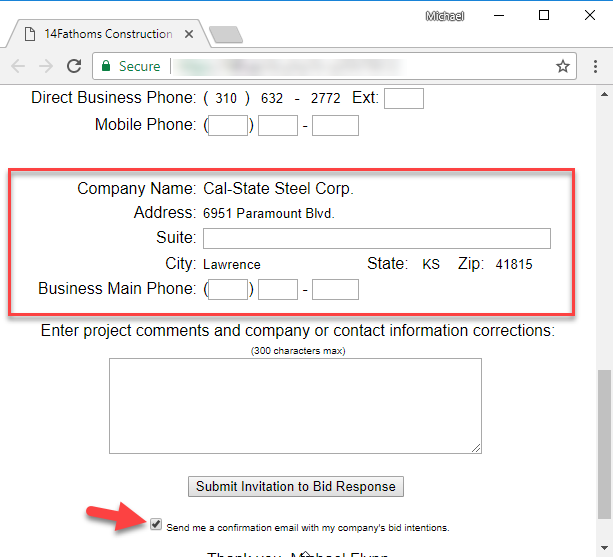 When adding a bidder you can select from your Bid List contacts (or a list of subcontractors used in the past for non-Bid List clients). Correspondence (phone and email) is tracked and synced and can be summarized using the Correspondence Log. Bidders in the Scope Sheet can be identified as “Awarded” and show in the online project directory. Improved refresh macros to include conditional formatting and data validation. Improved “mailto” code (and removed references to Outlook) so it breaks up email addresses so if too many emails are selected it will automatically break up into manageable email size. Added leveled bid amount to the “Bidding companies by trade” report. Added code to check bid total formula and ask user if it is changed. Added a comment to the Top Sheet budget column explaining where the data is linked. Bug Fix: When trying to delete a system row. Bug Fix: When adding multiple rows on multiple sheets, the status bar was reaching a maximum length that caused an error. Bug Fix: Add back template links and alternates drop down validation which might have disappeared after last upgrade. Rewrote upgrade module decreasing upgrade time by 40%. Fixed a bug if the trade sheet was just a number. Fixed a bug when checking for com add-ins if the user doesn’t have any installed at all. Fixed an issue with importing trades and subs from the latest bid list version. Created report of subcontractor plugs, allowances, and holds (accessible from the new Report menu.) Add plugs in “Plug Type” column. Will also pull data from external scope sheet linked on Top Sheet. Added a “Hide from sub” column. Allows estimator to include scope and costs that can be excluded when formatting into 1 page for sub. Show the column by double-clicking show/hide custom columns button. Allow merging of multiple scope sheet files into one file at once (mutlie select). TopSheet: Allow linking of multiple scope sheet files at once (multi select). When merging in scope sheet files it will ask if it should convert externally linked scope sheets on the top sheet to local links. Improved syncing of linked scope sheets on the TopSheet. Updates are automatically synced (no need to double click “U”). It will ask to add new trade lines on Top Sheet if an estimator sends updates for a non-included trade. Added a comment to the “L” with the last time the trade line was updated. Changed the AutoCheck function from the cell dropdown to the Top Sheet “Check for Updates” menu. Toggle it on/off and change the autocheck interval using the drop down menu. Reformatted the LiveUpdating and AutoCheck message. Added 3rd party add-in checker and instruction to disable. (Including a manual check in Advance About box). Fixed bug when extracting a sheet with the same name as a file that is already open. Fixed bug when a long list of Alternates would not sync. Updated Refresh Macros button to include all indirect formulas and all total row formulas on the TopSheet. Fixed a bug where the company logo wouldn’t be in proportion after an upgrade. Remove custom formatting styles during upgrade and after merge . Fixed a bug when merging custom scope sheet. Fixed an issue in the edit CSI box. Cleaned up input boxes and resize appropriated in Excel 2013 and newer. Fixed issue when adding new rows kept the “Double click to edit address” validation pop up. Fixed bug where added sheets might not go in the right order if there are custom sheets. Fixed an issue where files exported as macro-free files may not save the project name on the top sheet. Changed the “Create/Duplicate for Coworker” button to “Extract/Duplicate for Coworker” button. Fixed a bug where running the spellcheck from toolbar would error out if any cells had #REF or #N/A errors in them. Added more detail to the status bar when inserting boiler plate scope. Added date of the permanent instance to the sheet name so you can have multiple permanent instances of a single trade. Added the ability to duplicate trades sheets and custom sheets. Added ability to delete all existing bidders on a trade sheet (click “How to delete bidder” button and read instructions). Fixed bug when adding custom columns to top sheet. Fixed bug when copying and pasting formulas in columns in the top sheet. Now it ignores them and allows formulas to be copied and pasted. Made the advanced calculation settings more difficult to change. Fixed bug that removes carriage return in boiler plate scope so when copy/pasting outside of Excel it won’t be exported with quotes. Made the default 5 minutes to auto-save files if nothing else is selected. Corrected bug where the company logo wouldn’t be the right size on the enable macro screen. Fixed issue with sorting the Top Sheet trades if both trade name fields are blank. When adding new trade sheets the “Show/Hide bid stats summary” information is dictated by if it’s visible on the template. Fixed issue where the bid taker initials were not initially correct when linking a new file and Live-Updating was on. Fixed bug with merging scope sheets into project parent file with scope items saying they were duplicated even if they weren’t. Fixed autosave issue (old workbooks shouldn’t pop open anymore). Fixed issue were the logo on the Top Sheet would break (changed the logo from a link to an embedded image). Fixed the order of inserted rows on the Template. Should now add in order on the trade sheets. When linking external trade sheets to the Top Sheet, the file picker defaults to current file location. Resolved issues that could arise when switching between files or when closing files. Removed syncing of template scope items across files of the same project. Function will be added back when a fix is found that prevents template items from potentially being overwritten. Fixed a bug when exporting scope sheet for subcontractors. Added ability to right click and hold control to sort trade section in order across all trade sheets. When extracting sheets for coworker, added the custom sheets in the file as an option (and a checkbox to leave custom sheets in the current file even if extracted). Created a global “Send Update to Top Sheet” button so all trades in an estimator’s file are sent to the Top Sheet. When sending an update to the Top Sheet, the low bidder, leveled bid, and alternates (in a comment) are listed under the button. Fixed a bug with the calculation mode changing when the file was saved. Added “Delete multiple scope rows” (select rows and then use the right click menu). Fixed extract and merge file bugs involving custom sheets and links to other workbooks. When Archiving a file, the current folder path is used to store the file instead of the user’s desktop. Fixed a square foot sync issue. Top Sheet: Added ability for user to remove all trades (clear entire sheet). Top Sheet: Added ability to resort list by Trade/Package names. (Use “Data” menu in toolbar). Top Sheet: Added ability to force refresh all linked Trade Sheets. Top Sheet: Improved Check for Updates and Update All functions. Should be exponentially faster. Top Sheet: Sped up Top Sheet calculations when Live Updating is on. Added more details to status bar when adding or importing multiple trade sheets. Added your company “super user” contact details to About box. Added conditional formatting options (button next to conditional format button in the “Home” menu) so user can turn of duplicate scope item and other conditional formatting. Renamed “Scope Sheet Tools” toolbar to “Scope Sheet” toolbar. Improved sort function so links to other sheets aren’t broken after a resort. Fixed “Use All Data for All Trades” bug. Fixed errors that might come up if the company name in a bidder column is left blank. Fixed bug if project name or file name has an apostrophe. Added “Live Updating” to the Top Sheet so values changed on individual trade sheets automatically update the commit (white) rows. Turn it on/off using the “Check For Updates” down arrow on the toolbar (click “Toggle Live Updating On/Off”). Added ability to insert a new trade sheet row anywhere on the Top Sheet (use right click menu). Added ability to choose the export folder location and set the default for the project when exporting a bidder trade sheet. 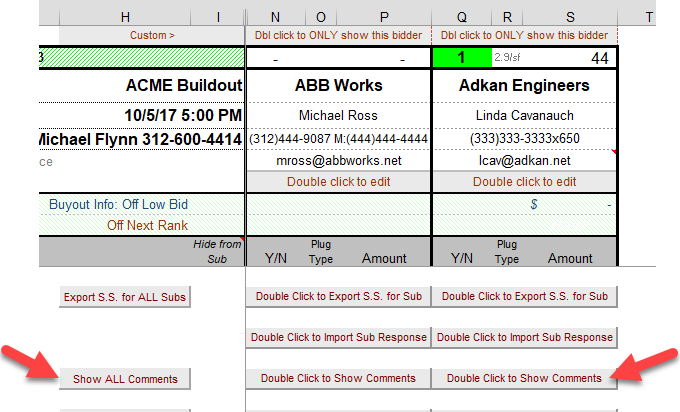 Export all bidder trade sheets at one time (use the “Dbl Click to Export S.S. for ALL Subs” button). Updated the boilerplate edit box. Added ability to save Alternate boilerplate items (in addition to trade-specific and excluded items). Fixed freeze pane bug on exported and archived sheets. Fixed bug when viewing an Excel file in Window preview pane and having a 14Fathoms product open. When creating a new Scope Sheet, the estimator name auto-fills. Upgraded copy/paste functionality (fixed bug with 64-bit systems). When importing bidders, will bring in both “Y” and “Bid Rec’d” in the Bid Status column in the project Bid List. Refreshing macros button also updates all formatting. Bug fix when exporting scope sheets for subs. Re-sort trade items in a section by selecting them and using the right click menu. 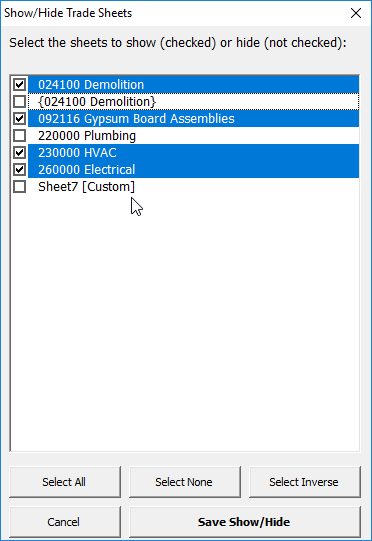 Create an archive/macro-free scope sheet file for architect/owner review. Accessible under “Scope Sheet Functions” button. Editing an existing alternate on the Setup tab will find/replace and make the change on existing sheets. 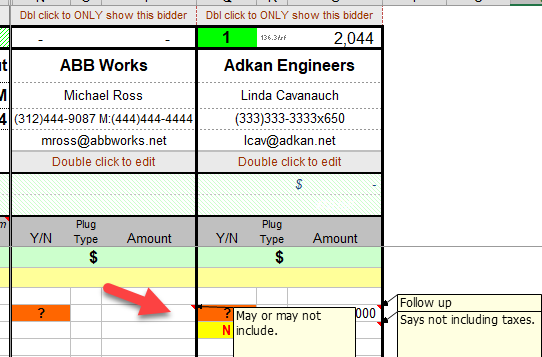 Added bid taker details which auto-fills estimator information when creating new Scope Sheets. Created “Team” toolbar on the Setup Tab and moved extract & merge functions there. TopSheet: Improved linking of external scope sheets. Link existing local trade sheets to an external sheet if the trade names match. Renaming a trade sheet will update the name on the Top Sheet to maintain the link. Corrected right click bug for users using Scope Sheet files on a shared drive. 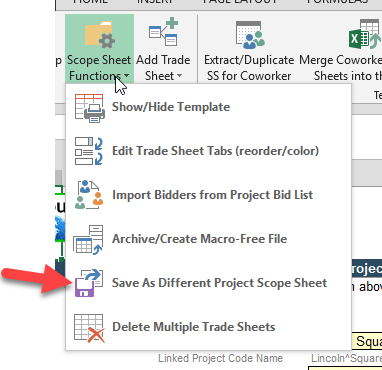 Upgrade scope sheets function complete, including the ability to upgrade project scope sheets! Scope Sheet version 8.2 and newer will notify you of an upgrade. Added ability to delete multiple scope sheets at one time (under “Scope Sheet Functions” menu). Boilerplate Scope– Add common trade scope items and exclusions per trade division regardless of the project. Creates consistent scope items at your company across projects. Boilerplate scope can be edited in Project Scope Sheets and/or in Master Scope Sheet mode only (set in Master Scope Sheet). Automatically add boilerplate scope on trade sheet creation. Boilerplate scope have basic formatting (bold, italic, indented). Select and add multiple trade sheets at once. Add all trade sheets for CSI codes selected in a 14Fathoms’ Bid List at one time (use Add Trade Sheet menu drop down button). Updates on a project template sheet are updated across all the project’s scope sheets (including those in other estimator files for that same project). 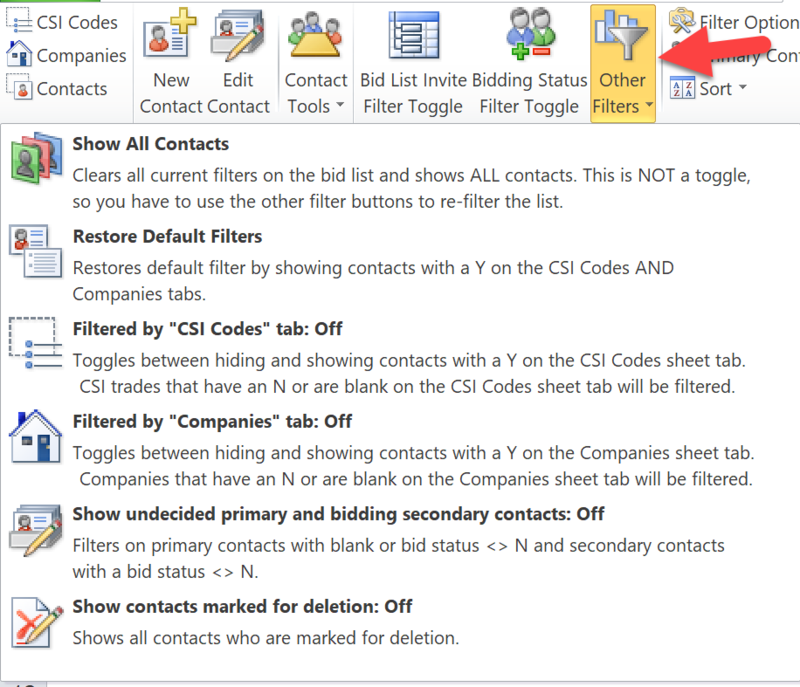 Add and edit CSI trade codes that sync across all company scope sheets and bid lists. (Click the down arrow in the Add Trade sheet dialog box). Trade names can added/edited in Project Scope Sheets and/or in Master Scope Sheet mode only (set in Master Scope Sheet). Mark specific trades as “Common Trades” (those used on most projects) and add all these common trades at one time. Simplified Setup tab now that all project information can be added and synced on the Template. Identify bidder columns as “Active”, “Ignore”, “Budget”, or “Awarded”. Use the drop down just above “Notes/Exclusion” section under a bidder. Active are normal bidders. Ignored bidders are not part of bid statistics and will sort to the far right. Budget will sort to the left and not be part of bidding statistics. Awarded will be used for historical bid statistics. Improved Right click functionality: Navigate, insert, rename, move, or delete by right clicking on the trade sheet tab. Add ability to re-sort sheets alphabetically. Helpful after merging sheets which may cause trade sheets to not be in order. Right click: Move scope items up or down. 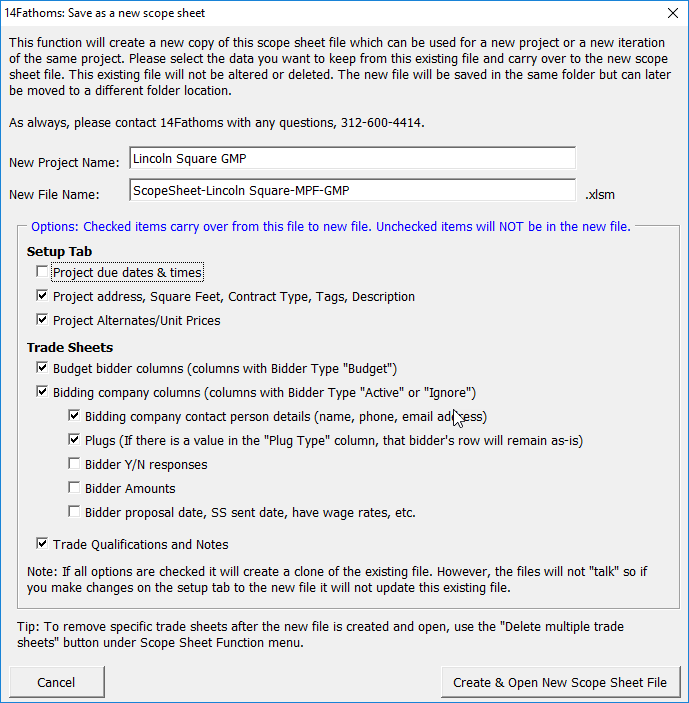 Right click: Copy formatting for scope items on Template to other trade sheets in the file. Improved spell check function and moved button to “Review” ribbon tab where users are used to using it. Added custom buttons to Scope Sheet toolbar. Add a trade row in the Top Sheet for every trade in the scope sheet button (use the drop-down menu option under Add Trade Row). Add custom columns by right clicking on a column. These will be added upon a Scope Sheet upgrade. Take a “Snapshot” of your bid summary at a point in time (as new drawings are issued, budget set to owner, etc.). Add a company logo to the top of the Top Sheet. Added buyout goal, contract amount, and buyout saving columns. Added indirect cost formulas to Alternates section. You can customize the last alternates formulas which will be copied to subsequently added alternates. Added Master Scope Sheet Mode Options to bottom of Setup tab. Allows setting of Master Scope Sheet location and controlling editing CSI Trade List and Boilerplate scope in Master Mode only or allowed at the project scope sheet level. About box: Added connection status and link to version change log (this web page). Format one page scope options (use drop-down menu). Customize showing wage rates, subcontractor instructions, and/or the trade name large in the header. These settings are reflected on exported Scope Sheets as well. Exported scope sheet files for subcontractor’s are now .xlsx format. .xls file format is phased out. Bug fix: total level bid total formula can be customized (ie for a phased project). Bug fix: export scope sheet title is correct on exported file (and in file name). Bug fix: exported scope sheets are now saved as .xlsx files. .xls are not longer supported. Moved Refresh macros and About button to always be visible on Scope Sheet Tools toolbar (on the far right). Set default excel printer to PDF or XPS printer to avoid issues caused by network printers. Bug fix: fixed error that sometimes came up when adding a custom sheet. Indent/outdent fix on multiple rows (use right click menu). Improved backup folder & save function to match Bid List. Auto-size rows when adding multiple rows at once. Refresh horizontal borders every time to minimize formatting issues. Changed CSI to use unique code number so trade sheet can be named whatever the user wants. Added ability to have blank, custom sheets (Choose blank sheet or import a sheet from another workbook). Moved Top Sheet buttons into Scope Sheet toolbar.